Our Service Department can select, design, install and maintain all types of commercial heating and cooling equipment. Oil, gas and steam are all core competencies. We have access to heavy equipment such as heavy load forklifts, cranes and other specialty equipment. Call our Service Department today for your next installation of system upgrade, we look forward to competitively pricing your next project! 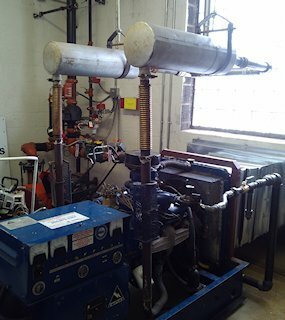 Installation of a Chrysler 318, 45kW generator operating in propane vapor service. The installation of a 20 gallon per hour high pressure liquid propane vaporizer for a 100kW generator installation at an equipment fabrication and process plant. Vaporizer was installed on a 1,000 gallon aboveground propane storage tank which also feeds the building heat. We can customize a maintenance agreement for the needs of your business. A basic maintenance agreement consists of a preferred labor rate, rooftop, boiler, water heater and other maintenance. Flat yearly fees and 24 emergency services are what make our maintenance agreements competitive and a great value so you can keep your business running. Manufacturing, country clubs, office buildings, retail and property management contractor. Our S-1 licensed service department is available on a yearly, quarterly or ad-hoc basis for inspection services. 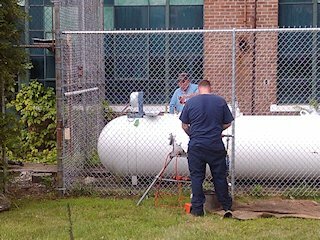 Whether you have purchased a new building and need to know if the systems installed are in good shape or you just need peace of mind, Power Fuels Propane commercial inspection services is here for you. We offer the commercial and industrial sectors bulk orders of fuel for fleet fueling. We deliver this bulk order to a storage tank or location; this location can be a construction site or maintenance facility, etc. With Power Fuels Propane fleet fueling program you will always have much needed fuel on hand at your specific location for easy access. This program is advantageous for general contractors, transportation sectors, country clubs, etc. You must have a an onsite storage tank or facility in order to qualify for fleet fueling. If you do not have a storage tank, no need to worry. 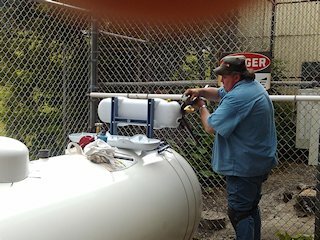 Power Fuels Propane can take care of the hassle by coordinating a tank install. So why wait? Contact us today so you can take advantage of fuel storage and our fleet fueling program today!